Florian Faltin invited to the 5th Austrian Indian Tour, presenting the most beautiful and demanding roads of East- and Southtyrol. As a „firework for lovers of curves“ he announced the tour in the invitation. That was highly understated… There was not one single mile of straight road. Even my own travel to the tour itself was demanding, as the ride over Mt. Grossglockner was challenging. At 9000ft. there was lots of snow left from winter, with 4 degress celcius in July. The start of the Tour was in Kartitsch in Easttyrol this year. Hotel „Waldruhe“ (wich means something like „Quiteness of the Wood“) made it’s name any honour, till the first Indians arrived. Over the past years we have become good friends and everyone was happy to be back together with the group. At the evening there was delicious BBQ to celebrate the reunion. 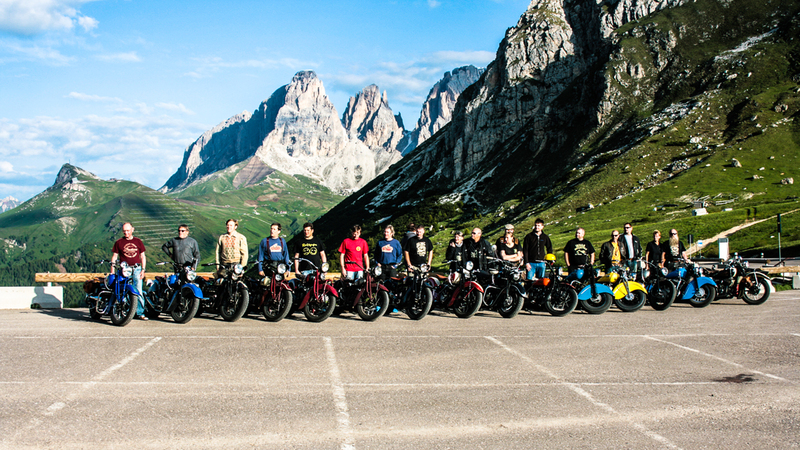 Some new riders from Switzerland, Germany and Belgium had joined the group and many past stories of the last two years had to be told. 8 Chiefs, 7 Scouts and Sport Scouts and even two Fours were waiting in the garage for the start next morning. With a little prayer sent to Springfield, Massachusetts and a four-leaved clover in the pocket, we started the next day with about 120 miles. And our preparation worked well. Florian led us through the Höhlenstein Valley, the Sextener Dolomites National Park, up to the Pass Tre Croci, where the famous Mt. „Three Peaks“ is located. Down, through the valley heading to Cortina d’ Ampezzo and up to Pass Giau with 7500ft of elevation. Having perfect weather, we rode trough a breathtaking landscape and made our way to Lake Fedaia. Man and machine worked better together than on the last day and so everything went on smooth and easy. Never praise the day before evening…. On a steep climb at Pass Fedaia the throttlecontrol went loose on one of the Sport Scouts. The rider, Manfred Fetscher, was able to get the motorcycle to a halt, but the part of the road was that steep that the tires and his boots found no grip on the asphalt, wich was covered with sand, dust and gravel. It took three men to get the Scout to a save stand. A helping rider had parked his Chief with the hot engine from the steep climb. The fuel in is carburator was now boiling like a whirlpool… The Chief was short before catching fire and we were all glad when the situation was solved. At the end only one carburatorcover was missing, wich had disappeared into the abyss of the valley, while we were repairing the Scout. 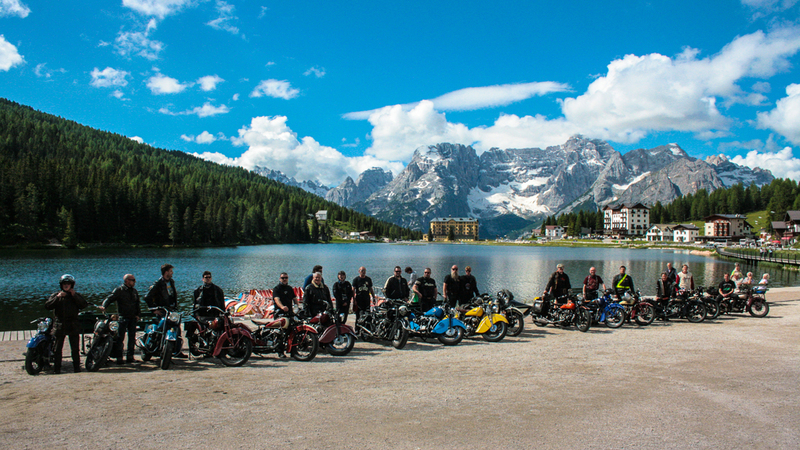 Our ride went on to the Marmolada Mountains, following the road to Pass Pordoi. We enjoyed the astonashing panorama and the group went faster and faster. The day ended with a ride arround the Sella Mountain Group. Unbelievably but true, 4 (!) mountain passes forming a circle without passing a single village! At Joch Sella we were close to heaven this afternoon. At the early evening, the mountains began to glow yellow and red, fading out into a unreal blue. After 8 hours of pure riding pleasure we sat down for dinner at the Hotel „Col di Lana“, Pass Pordoi. The food was great, the wine even better….. the night was short. Wackup 6.30a.m., breakfast 7.00a.m., meeting at the parkinglot 8.00a.m., „start your engines“ 8.30a.m. Same procedure as every day. We had 130 miles ahead of us, the air was cold, the weather perfect. Walls of snow around the hotel, made us believe, that it could not be July…As the Indian 4 of Florian led the field, we quickly were back in the rythm of curves and corners. After some time riding down in the valley we arrived at the Karer Pass. We crossed the Rosegarden Mountains, wich lay in front of us in the golden morning light. Everyone of us knows those mountains from postcards, but riding your indian through the land is just wonderful. Next challenge was the Niger Pass, after wich we descended down to Southtyrol as we know it. Warm, mild climate makes the cultivation of wine and apples easy, the landscape is much more mediterranian than elsewhere. After getting some original italian Espresso we headed onto St.Ulrich and Wolkenstein. Following the Gardavalley we climbed up to the Groedner Joch were we had lunch. After another 60 miles we reached our last highlight of the tour, the Furkel Pass. A extremly narrow, steep road went up to the top of the mountain to descent in same fashion to the valley on the other side. Leaving the Dolomites at Toblach, we crossed the border to Austria and finished the tour a little bit later, arriving at the hotel in Kartitsch. At the parkinglot, Florians family and the team of the hotel was waiting for us, serving us some sparkling wine to celebrate the wonderful tour. Our motorcycles were gifted with flowers and feathers and the owner of the hotel once again aided us with free beer. At the evening, our celebration was joined by the first and second mayor of Kartitsch wich had heard about our iron redskins and Florian was awarded with a document, issued to thank him for his work with the tour. There is not much left to say… Every Austrian Indian Tour is as rich in variety as the people wich attend the tour. Every two years, a pleasure to ride.